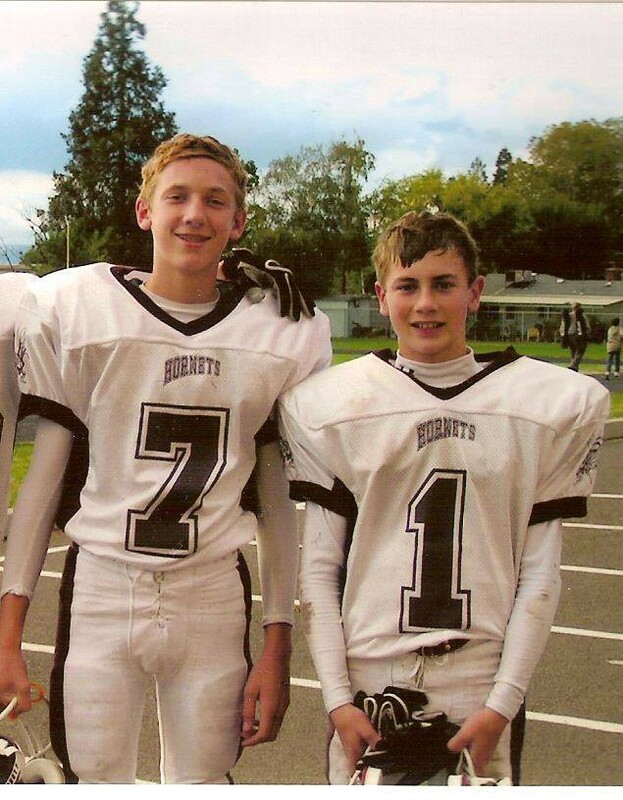 Jack Singler (left) and Matt Retzlaff (right) after a middle school victory. Every where football is played, boys grow up dreaming that they might spend a lifetime in the sport together. Southern Oregon University seniors Jack Singler and Matt Retzlaff have lived that dream. They are have been playing football with each other since 2001. This last Saturday, November 11th marked the last time they would play football with one another. Retzlaff and Singler, both Medford natives, have been friends for as long as they can remember. Both had older siblings growing up playing sports with one another so they spent countless hours watching them until they were old enough to compete themselves. Jack’s father, Bill Singler, is the current Head Coach of the South Medford high school football team where he has been for the past 17 years. Matt’s mother is Shawn Retzlaff, who before marrying Mike, was a Spiegelberg, which is a well-known name in the Medford area. The stadium where North and South Medford play is named after Retzlaff’s grand-father. Singler played quarterback, and Retzlaff a wide receiver. The connection started in youth football and blossomed from there. They played on the same team through their senior year at South Medford High. They led their teams to the playoffs but came up short of the title game every year. Both had aspirations to play collegiate football, but weren’t sure they would end up at the same spot. Singler and Retzlaff’s first season together since high school was 2014 when the Raiders won their first ever National Championship in football. Singler was the signal caller for the team, but did not see the field because he played behind All-American and NAIA Player of the Year Austin Dodge. Retzlaff had a very productive year on offense and special teams. Following the departure of Austin Dodge, statistically the best quarterback this level of football has ever seen, came a position battle for the 2015 season. Singler had a great 2015 spring ball but ultimately lost the battle to American River transfer Tanner Trosin. The Raiders made it back to the National Championship game but fell short to the same Marian team they beat 365 days prior. This season was the last ride for Retzlaff and Singler. Singler came into the season still backing up Trosin but was constantly praised by fellow teammates and coaches about his work ethic and ability to still help the team get better. Singler has a great football mind and acted as a coach in many ways adding input coaching guys when he could. All the while Retzlaff was breaking records and continued to be a steady threat for the SOU offense. Southern’s second game was against FCS UC Davis, a money game for the Raiders. That game starting quarterback Tanner Trosin broke his foot holding him out of the rest of the season. Enter the Rogue Valley’s dynamic duo. Singler would now start the rest of the games alongside best friend Matt Retzlaff. Retzlaff’s season this year cemented his legacy in Raider football as one of the best receivers to ever play in this program. He has tallied 3,467 yards, 248 total receptions, and 45 total touchdowns. After Singler took over the offense he put up great numbers totaling 3,003 passing yards and 25 touchdowns through the air. 13 of Singler’s 25 touchdowns went to Retzlaff this season. When you watched them play there was no doubt there was a connection between the two, whether you knew they played ball together their whole life or not. The Raiders stumbled this year finishing with a 5–6 record and did make the NAIA playoffs. Even though the team struggled these two players never ceased to amaze on Saturday afternoons. What these two friends accomplished this year will be remembered by Raider fans forever.